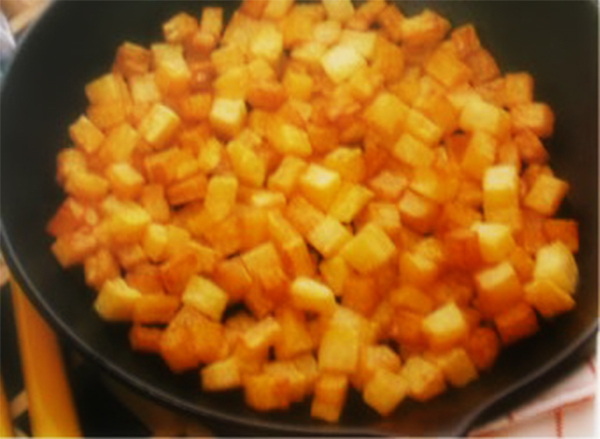 These fried potatoes are a classic dish that's also called patate a tocchetti, i.e. cubed potatoes. They should be browned, but not crunch, and go perfectly with abbacchio scottadito (grilled lamb chops), or with grilled pork chops. 1 Peel and dice the potatoes (1/2-inch squares), and let them sit in cold salted water for an hour. 2 Dry them well and heat the oil and lard; when a bread cube tossed in begins to brown immediately, remove it and add the potatoes. 3 Fry, stirring the potatoes about gently to keep them from sticking to the sides of the pan, and when they're golden remove them and set them to drain for a couple of minutes on absorbent paper. 4 Transfer them to a serving dish, dust them with salt, pepper, garlic powder and Italian herbs before serving. Note: If you are making lots of fries you should fry them in batches lest they cool the oil and absorb it.